Flint nodule: Flint is a variety of microcrystalline or cryptocrystalline quartz. It occurs as nodules and concretionary masses, and less frequently as a layered deposit. It breaks consistently with a conchoidal fracture and was one of the first materials used to make tools by early people. They used it to make cutting tools. This specimen is about four inches (ten centimeters) across and is from Dover Cliffs, England. Flint is a hard, tough chemical or biochemical sedimentary rock that breaks with a conchoidal fracture. It is a form of microcrystalline quartz that is typically called “chert” by geologists. Flint often forms as nodules in sedimentary rocks such as chalk and marine limestones. The nodules can be dispersed randomly throughout the rock unit but are often concentrated in distinct layers. Some rock units form through the accumulation of siliceous skeletal material. These can recrystallize to form a layer of bedded flint. Flint is highly resistant to weathering and is often found as pebbles or cobbles along streams and beaches. Early people who used flint to make tools often prospected these areas to find nicely shaped pieces of flint for making specific tools. 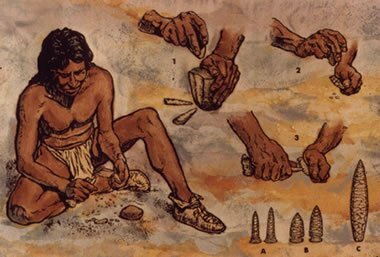 Flintknapping: Prehistoric people became highly skilled at flintknapping, a method of shaping flint into useful objects such as drills, arrowheads, knife blades, and spearheads. National Park Service image. Flint has been used by humans to make stone tools for at least two million years. The conchoidal fracture of flint causes it to break into sharp-edged pieces. 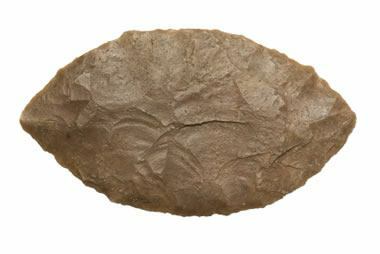 Early people recognized this property of flint and learned how to fashion it into knife blades, projectile points, scrapers, axes, drills, and other sharp tools. They developed a method of striking a piece of flint to produce a sharp edge known as flintknapping. Through trial, error and practice they became highly-skilled craftsmen who could manufacture tools with a few quick blows. If the tools were broken or damaged in use, they were often reshaped into smaller tools of similar function. Flint Knife: A lithic knife made from flint. Photo copyright iStockphoto / Martin Vallière. 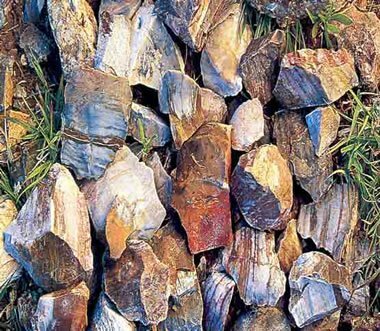 The value of flint for making sharp tools was discovered and utilized by Stone Age people in almost every early culture located where flint could easily be found. Where flint was not locally available, people often travelled or traded to obtain premade tools or pieces of flint for manufacturing. 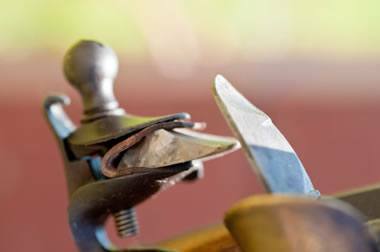 Their survival depended upon having a durable material that could be used to produce sharp tools. Ohio Flint: The Vanport Flint has been quarried by people for at least 12,000 years. It outcrops in a layer between one and twelve feet thick along Flint Ridge in eastern Ohio. Native Americans produced the flint from hundreds of quarries along the ridge. Some of these people travelled hundreds of miles to collect the flint, used it to make a variety of tools and weapons, and traded it widely throughout what is now the eastern United States. One of the most important localities for flint in eastern North America is Flint Ridge in eastern Ohio. Native Americans discovered this deposit and produced flint from hundreds of small quarries along the ridge. This “Ohio Flint” occurred in distinctive colors and was treasured by Native Americans. Alibates flint quarries: Heavily quarried landscape at the Alibates Flint Quarry National Monument. Over 700 quarries can still be seen today. These were all dug by hand without metal tools. National Park Service image. Alibates flint: The Alibates Flint has been used by people of southwestern North America for about 13,000 years. The quarries used by these people have been preserved as part of the Alibates Flint Quarry National Monument. National Park Service image. 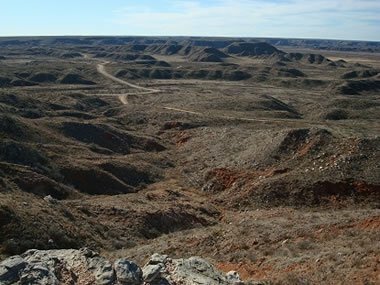 In the area that is now the Texas panhandle, Native Americans discovered an area where weathered flint littered the ground. This flint was weathering out of a dolomite beneath the thin soil cover. These people discovered that fresh, unweathered flint of high quality could be obtained by digging down a few feet. From about 13,000 years ago into the 1800's, this area was continuously mined for the high-quality flint. The flint was used to produce projectile points, scrapers, knives, and other stone tools. In the 1800's the flint was also mined for use as gunflints. Over 700 small quarries are still visible today and have been preserved as part of the Alibates Flint National Monument. Although these mining operations were amazing feats of engineering, just as impressive was the geological understanding of the workers. They knew that the flint was below the ground even though it did not outcrop anywhere in the immediate area. They also knew that the highest quality flint layer was below lower quality zones that were encountered during the early digging. Flintlock: Close-up of a French flintlock rifle showing a flint ready to strike the steel frizzen, which will produce the spark needed to ignite the powder. Photo copyright iStockphoto / Michael Westhoff. Early firearms, such as a flintlock, had a piece of flint attached to a spring-loaded hammer that was released when the trigger was pulled. The hammer struck a piece of steel known as a "frizzen" to create a shower of sparks that ignited a small pan of powder. That touched off the primary charge which exploded to propel the ball down the barrel. Flint Gemstones: Flint is often cut into dome-shaped stones known as cabochons. These can be set into pins, belt buckles, pendants, bolos, and other jewelry items. Most people have heard of a gem material called "jasper". Jasper is an opaque variety of cryptocrystalline quartz. It obtains its color and opacity from a large amount of included mineral particles. 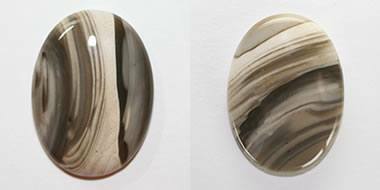 Flint and jasper are similar materials and both are varieties of a gem material known as "chalcedony". Chalk Cliffs: Chalk cliffs can be an excellent place to find flint. As the soft chalk weathers away, flint nodules fall to the beach below. 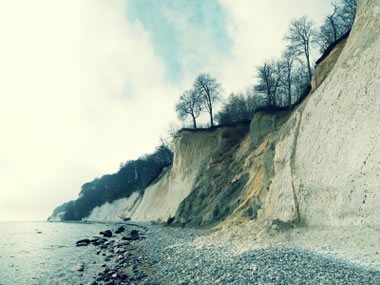 Image of chalk cliffs along the Baltic Sea, photo copyright iStockphoto / hsvrs. 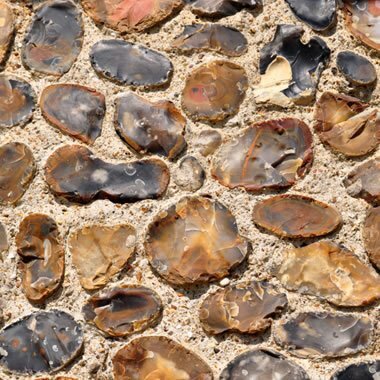 Flint wall: A portion of a wall of a medieval building in Suffolk, UK, built with split flints. Photo copyright iStockphoto / John Woodcock. Flint is a microcrystalline variety of quartz. 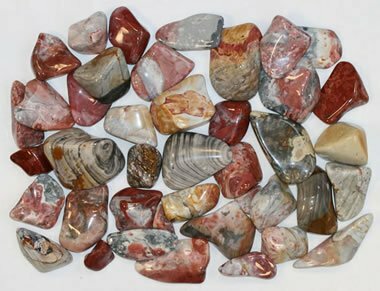 Materials of this description have been given a wide variety of names, including chert, jasper, agate, and chalcedony. 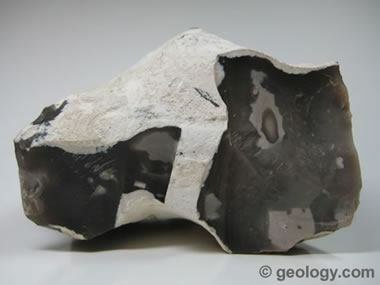 Most geologists use the word "chert" instead of "flint". Some people believe that the name "flint" should be reserved for dark-colored chert that formed as nodules in limestone or chalk. Some archaeologists believe that the name "flint" should only be used when the material has been fashioned into an artifact. The name "flint" has been so closely associated with starting fires that man-made materials used to produce sparks in cigarette lighters and survival kits have been given the name "flints." "Novaculite" is a metamorphic rock that is similar to flint. It has a sedimentary origin, just like flint, but diagenesis and metamorphism have increased the size of the quartz microcrystals. It has been used for thousands of years for making sharp tools and weapons. Some specimens have a texture that make them useful as a sharpening stone. The World’s Oldest Stone Artefacts from Gona, Ethiopia: Their Implications for Understanding Stone Technology and Patterns of Human Evolution Between 2.6 and 1.5 Million Years Ago, Sileshi Semaw, Journal of Archaeological Science, Volume 27, pages 1197-1214, February 2000. 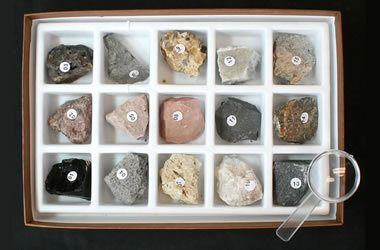 Flint: Ohio’s Official Gemstone: Garry L. Getz, Educational Leaflet Number 6, Ohio Geological Survey, 2012. Ohio’s State Gemstone - Flint: Website article, Ohio History Central: An Online Encyclopedia of Ohio History, Ohio Historical Society, 1999. Grime's Graves Flint Mining Complex: Article from Wikipedia, the free encyclopedia, April 2012. The Neolithic Flint Mines of Sussex: Britain's Earliest Monuments, website article, Bournemouth University Archaeology Group, 2011.